If you have been out and about lately, you have heard the jingle of holiday music filling the shops and preparing for the kickoff of the Christmas season. While it is exciting to start decorating and planning our Christmas lists, one thing that can often go forgotten is the impact all of our holiday activity has on the environment. Tissue paper, gift wrap, carbon emissions and packaging are only some of the carbon print left behind come the new year, why not consider going green this Christmas? 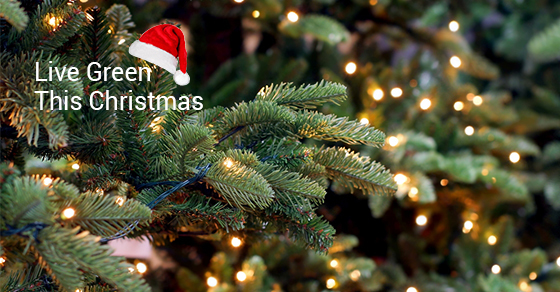 Here are some simple tips to help you and your family celebrate a Green Christmas! If you are feeling frosty inside your home make sure to bundle up before cranking the heat! Put on toasty socks and a sweater and use a blanket when curled up watching TV or reading to reduce both your environmental impact and your household bills! A great way to celebrate days of Christmas past is to (safely) make use of last years’ office gift exchange gift–the candles! If you are putting up Christmas lights, make sure to switch to energy efficient LED lights and set a timer so they aren’t on all night. No one likes a Wally Wastes-a-lot! This year, make use of gift bags, tissue paper, and ribbon you already have before buying more that will just be thrown out. If you do use these items, be careful whilst opening gifts and take the moment to refold paper and tissue instead of throwing them out. If you are aiming for a no-waste holiday, why not use gifts to wrap other gifts? For example, if you are getting your children pyjamas and a special toy, why not wrap the toy using the fabric of the PJs? Reusable Santa Sacks adorned with kids names are a wonderful way to reduce waste and start a tradition for years to come! Skip the travel and commuting and take some time to stay local. Plane and car petrol usage are nasty contributors to the carbon dioxide emitted, which wreaks havoc on our environment. If you must travel, consider walking, public transit or carpooling. Pull out the crystal goblets, good china, and fancy flatware this holiday season instead of your annual trip to the dollar store to purchase your table settings. A family of six can fill an entire waste bag full if you use paper plates for multiple courses, serviettes, plastic knives, forks, and serving spoons, and disposable cups and glasses. Pull out the good stuff and enjoy! These are only a few tips to help you get started. We’re always happy to help with more great ideas for going green.